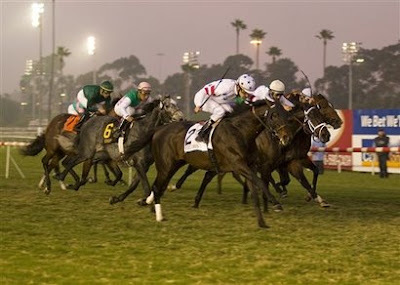 Thoroughbred Times (edited) – Virginia Derby runner-up Court Vision completed a last-to-first rally under Ramon Dominguez to secure his first Grade 1 win in the $500,000 Hollywood Derby (G1) on Sunday at Hollywood Park. Trained by Racing Hall of Fame member Bill Mott for owners IEAH Stables and WinStar Farm, Court Vision closed with a rush from the outside to win by three-quarters of a length over runner-up Cowboy Cal. The three-year-old Gulch colt covered 1¼ miles in 2:01.43 on turf rated as firm. Jockey David Flores sent Muny from the outside post to the front and the Oak Tree Derby (G2) winner led the nine-horse field through dawdling fractions of :25.10, :49.41, and 1:13.40 through six furlongs while Court Vision saved ground in last place. Multiple Grade 3 winner Cowboy Cal tracked Muny from second through one mile in 1:43.40. 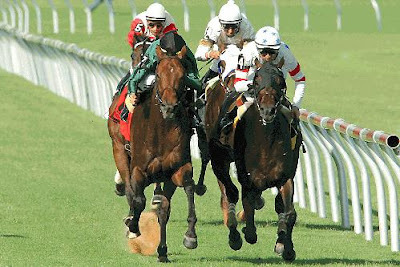 Court Vision raced three wide into the stretch and advanced to seventh as Muny led by a half-length. The multiple graded stakes winner eagerly responded to urging from Dominguez with about a furlong to run to win for the second time in eight starts this year. Cowboy Cal raced between foes late for second place, three-quarters of a length in front of third-place finisher Midships. Gio Ponti, the 3-to-1 favorite, chased the early pace but lacked running room in the stretch and finished seventh. Dominguez swept both Grade 1 races on the card with the win after riding Cocoa Beach (Chi) to victory in the Matriarch Stakes (G1) two races prior to the Hollywood Derby. Court Vision (pictured above with Gio Ponti #7, green silks in the 2008 Virginia Derby G2) entered off a victory in the Jamaica Handicap (G2) on October 4 at Belmont Park to halt a six-race winless stretch, including a 13th-place finish in the Kentucky Derby Presented by Yum! Brands (G1), after capping his juvenile campaign with a neck win in the Remsen Stakes (G2) at Aqueduct. Bred in Kentucky by William S. Farish and Kilroy Thoroughbred Partnership, Court Vision is out of the Storm Bird mare Weekend Storm. 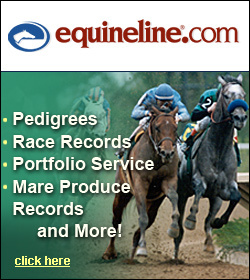 He has won five of 12 career starts and amassed $1,006,400 in career earnings.